This post was sponsored by International Delight One Touch Latte and WhiteWave Foods Company. 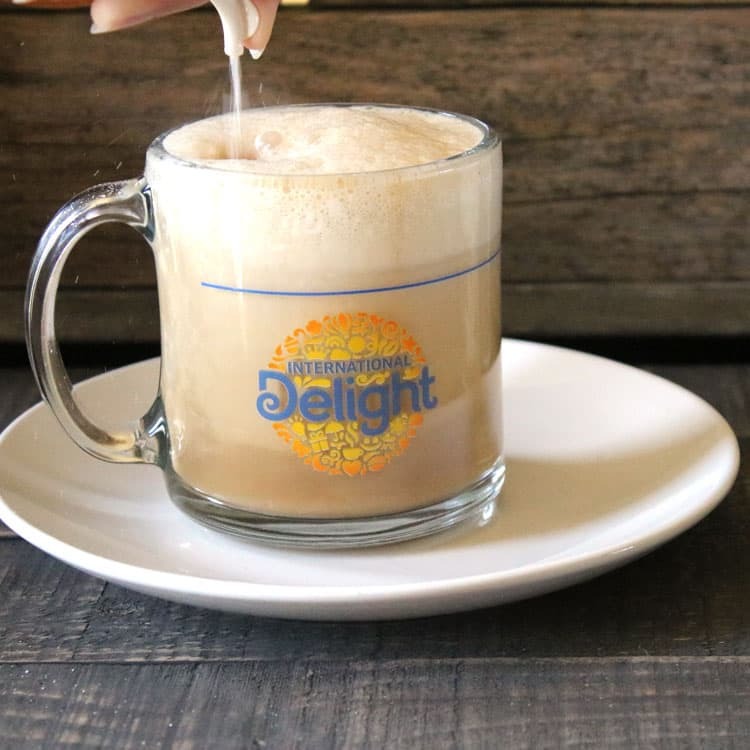 Are you ready to learn how to make an EASY latte at home using International Delight One Touch Latte? 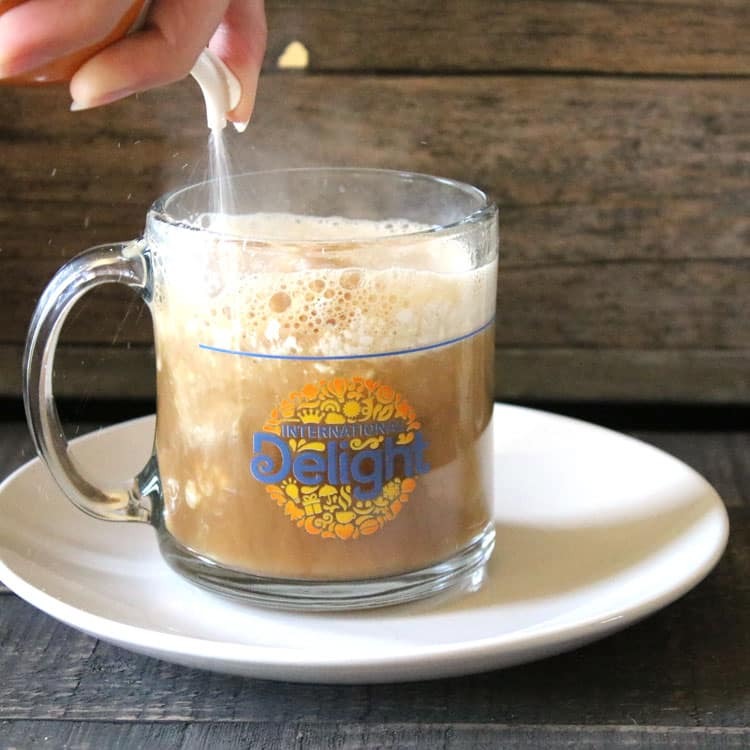 Not only are these lattes flavorful and delicious, they are much more affordable than going out to a coffee shop every time you want to get your coffee fix. Step One: Fill up your coffee cup 2/3 of the way full. 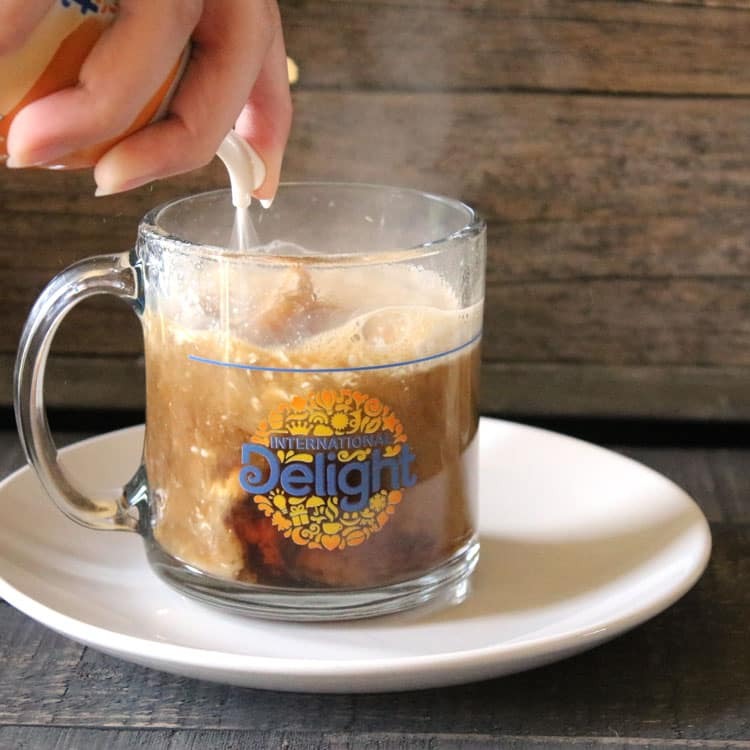 Step 2 involves shaking up your favorite flavor of International Delight One Touch Latte. Once you have shaken it up good, you are ready to move on to Step 3, one which is essential to follow exactly. Press hard on the International Delight One Touch Latte nozzle, while pointing the nozzle into the cup. Press gently, and you will not get the correct effect. Press hard, and your latte will essentially make itself, which is exactly what you want. Keep pressing until your coffee cup is full and ready ready to drink. Just a few simple steps, and you can have a delicious latte every day, right in the comfort of your home or office. And, you can even use it in a recipe like we did below. Yum! 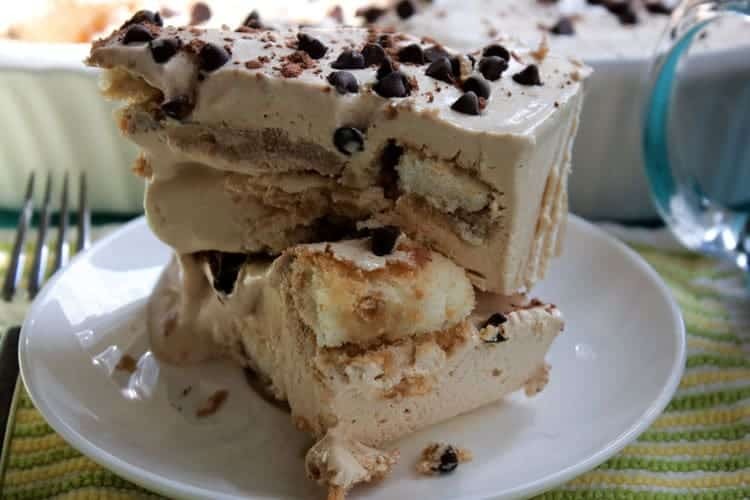 We absolutely love creating fun, new desserts (like this icebox cake! 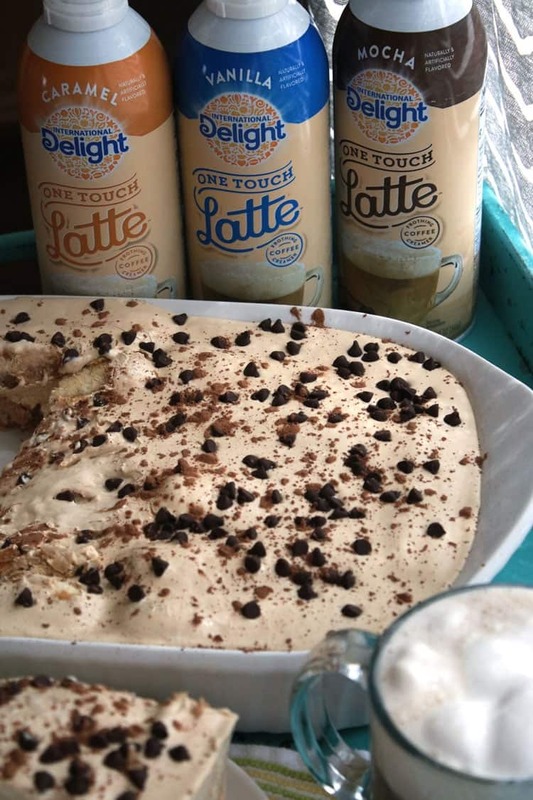 ), so when we had the chance to try out International Delight One Touch Latte, using our delicious Caramel Latte to make a frozen ice box cake was pretty much a no-brainer. The idea for the recipe developed because we love coffee flavored desserts (think tiramisu) that can be easily thrown together. We already had most of the ingredients that we needed to make this recipe, so all we needed was a quick trip to the store to pick up a couple more. Making a latte has never been easier, and they can be made right at home. 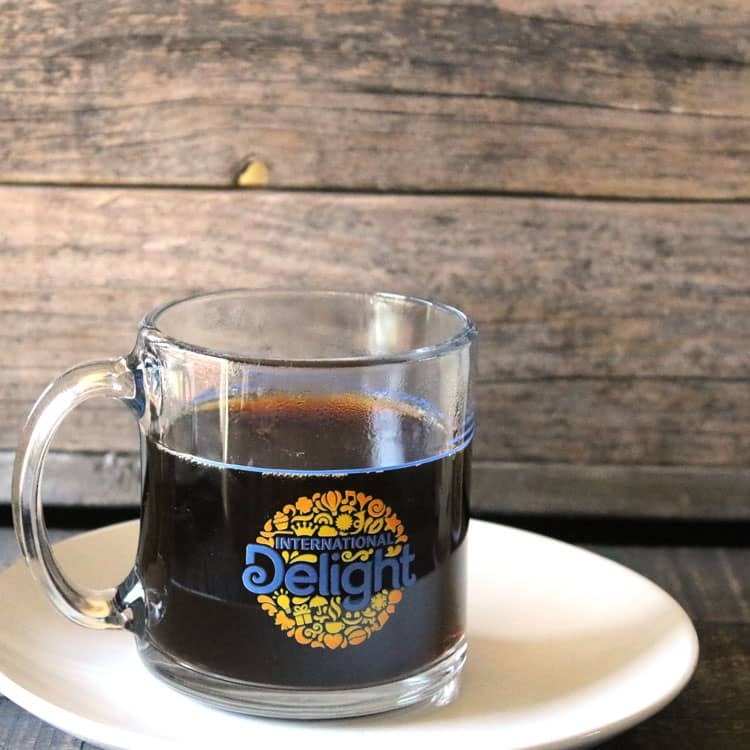 Seriously, the ability to make a gourmet coffee drink right at home in the kitchen at a minimal cost is an affordable luxury to be indulged in. 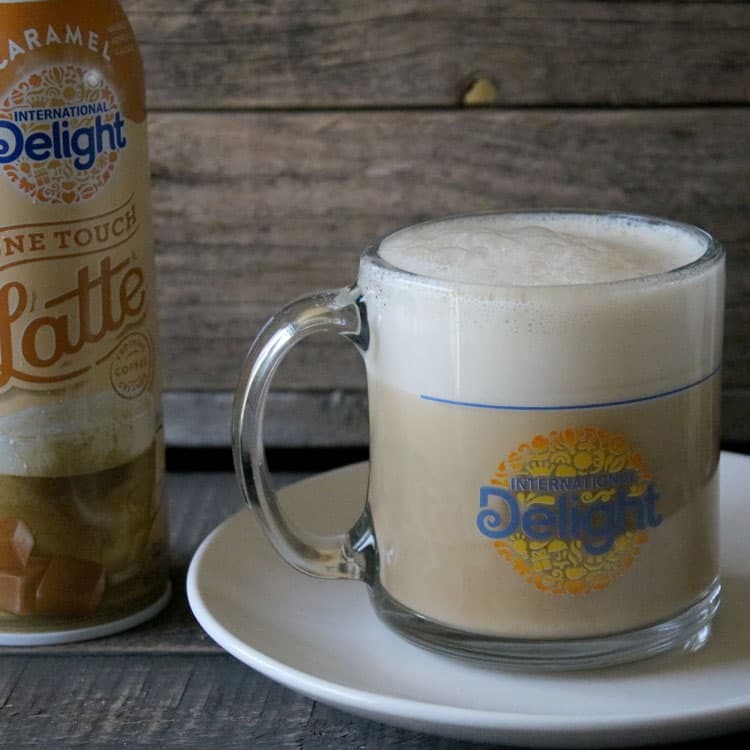 We love how easy it is to make a latte using International Delight’s One Touch Latte. Whether you’d like a Caramel, Vanilla or Mocha, you’re going to love sipping one of these lattes. For our latte (and our yummy No Bake Icebox Cake), we used the Caramel flavor. And let us tell you…that flavor is SO SO good! We’ve used just a few ingredients: coffee, Caramel One Touch Latte, Caramel sweetened condensed milk (if you can’t find caramel sweetened condensed milk, mix in some caramel sauce to enhance the flavor), cream cheese, lady fingers, whipped topping, mini chocolate chips, and cocoa powder. Once you’ve made your Carmel Latte, you’re ready to make this tasty dessert. 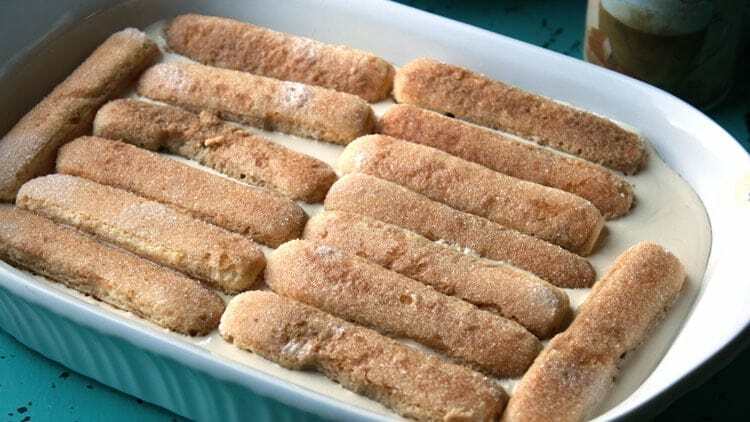 The first step is to make a single layer of lady fingers on the bottom of a dessert dish. The dish we used was a little smaller than a 9×13 pan. Pour half of one coffee cup Caramel Latte over the first layer of lady fingers. It will soak up into the cookies. Next, with an electric mixer, combine 2 8 ounce bricks softened cream cheese together with a small can of caramel flavored sweetened condensed milk and whipped topping. Pour half of the cream cheese mixture over the first layer of lady fingers. After you’ve done that, place remaining lady fingers on a plate. Pour the 2nd half of the caramel latte over the rest of the lady fingers and then carefully lift them off of the plate and place on top of the cream cheese layer in the dessert dish. Pour remaining cream cheese mixture into the dessert dish. Then, sprinkle with mini chocolate chips and lightly dust with cocoa powder. Once you’ve finished building this decadent dessert, put it in the freezer overnight to firm up. When you’re ready to serve up this amazing dessert, take it out of the freezer and let it sit on the counter for 20-30 minutes to thaw just a bit so you can scoop out a piece to serve. 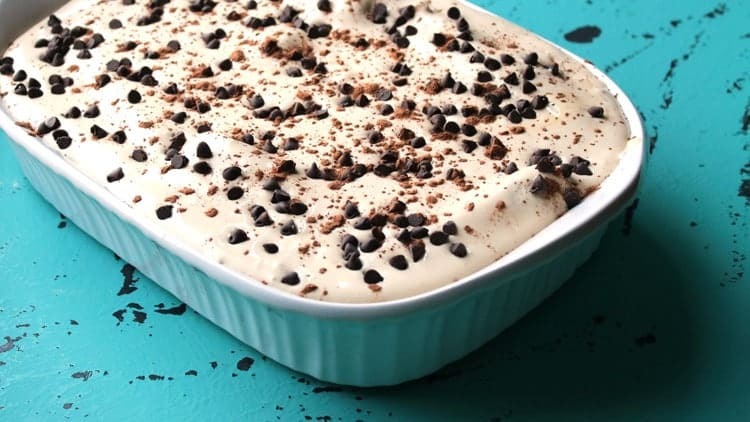 This frozen coffee dessert is perfect for the summer because it’s cool, flavorful and refreshing. Desserts are meant to be shared, and our Caramel Latte Ice Box Cake certainly should be shared. 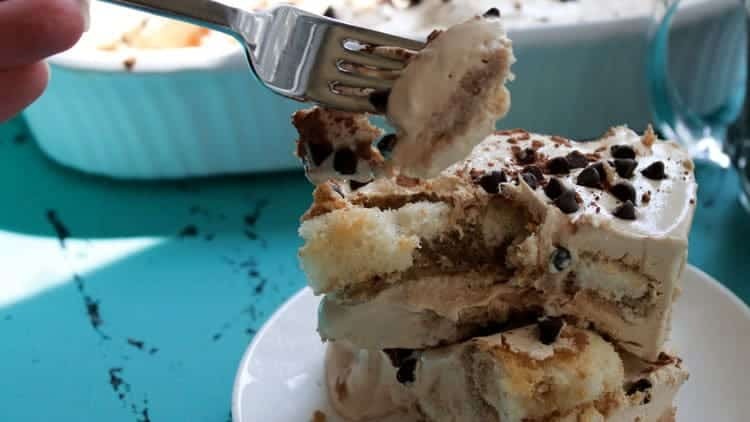 The thing we love most about icebox cakes is that no matter what recipe you pull up, icebox cakes are ALWAYS easy to make. They normally involve layering delicious ingredients until you have one big cake-like concoction. 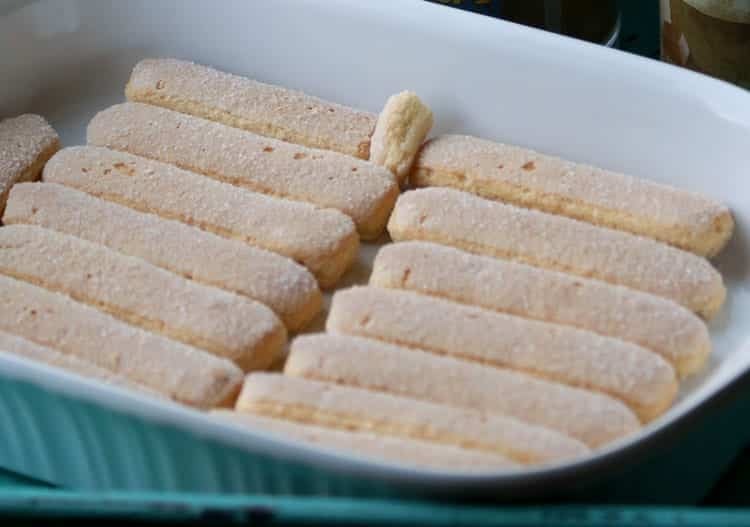 Form a single layer of lady fingers on the bottom of a dessert dish. The dish we used was a little smaller than a 9x13 pan. After you've done that, place remaining lady fingers on a plate. 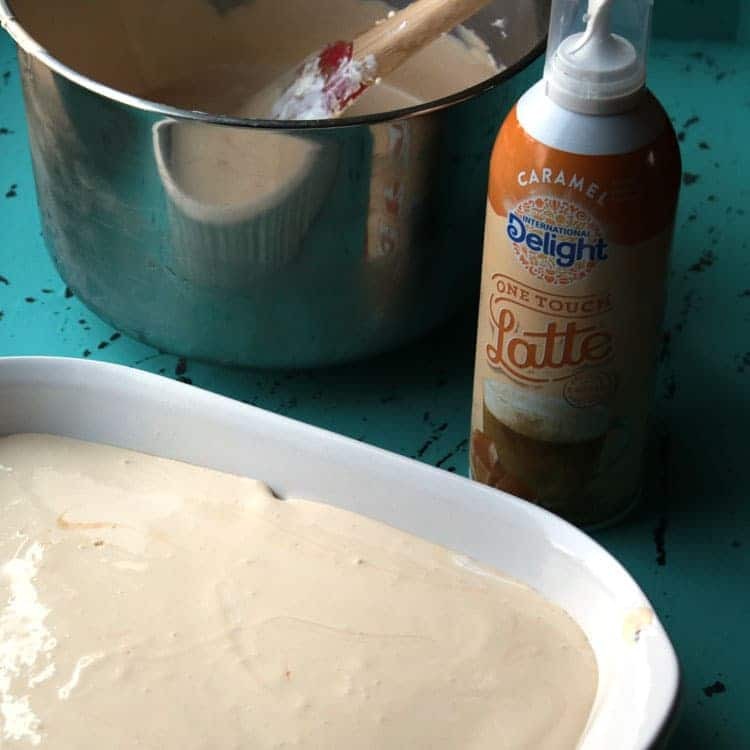 Pour the 2nd half of the caramel latte over the rest of the lady fingers and then carefully lift them off of the plate and place on top of the cream cheese layer in the dessert dish. Once you've finished building this decadent dessert, put it in the freezer overnight to firm up. When you're ready to serve up this amazing dessert, take it out of the freezer and let it sit on the counter for 20-30 minutes to thaw just a bit so you can scoop out a piece to serve.